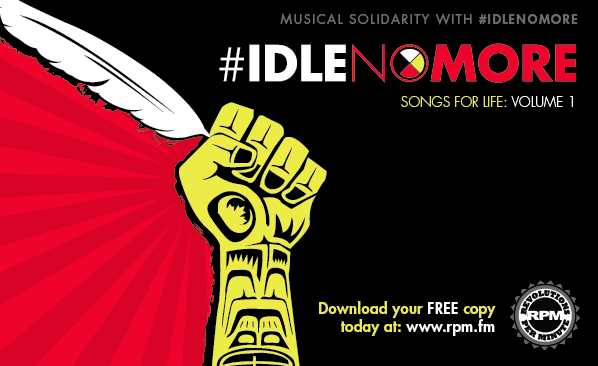 Idle No More: Songs for Life Vol. 1 is the first of an ongoing series of free downloadable compilations of songs by artists who support the vision of Idle No More, Indigenous and allies. Volume 1 features a broad and diverse array of artists - everyone from Derek Miller (whose contribution, 7 Lifetimes, is a brand new track inspired by Chief Theresa Spence), to John K. Samson of the Weakerthans. Bluesey-roots from Digging Roots. The indie stylings of Whitehorse. A funky hip hop jam from Plex with Wab Kinew and Sarah Podemski. It’s a feast for the ears. A celebration. And we’re only just getting started. If ever we’ve been idle - whether in our thoughts or our actions - we are now Idle No More. This exciting collection - and the additional volumes that will follow soon (there's that many artists and voices!) - was conceived by Marty Ballentyne, Holly McNarland, Kevin Joseph and RPM's Ron "Ostwelve" Harris. Listen to and download the tracks now, and read on below. Music is transcendent. Somewhere in between the melody, the rhythm, the words, the instruments and the people playing them, it all adds up to something more than the sum of its parts. It’s magic! Music soothes frayed nerves. It makes you dance. It says things you just can’t put into words. Songs make you think, make you feel, bring you up, bring you down, bring you around. For some music is loud and groovy on a Friday night; for some, it’s quiet and calming on a Sunday morning. Music brings us all together. We have it in common, along with the air, the water, the earth beneath our feet, and the sky above. Idle No More began in November as a grassroots effort by four women to educate people about Bill C 45, tabled by the federal government. The news media and commentators such as Rick Mercer had given the bill cursory attention when the bill was introduced in Parliament in mid October. Hidden inside the 440 page bill are changes that will affect all Canadians, now and in the future. Most Canadian waterways, protected since the days of John A. Macdonald, are protected no longer. Amendments have been made to The Indian Act without consulting First Nations. A series of teach ins by Sylvia McAdam, Nina Wilson, Jessica Gordon and Sheelah McLean first brought awareness, then concern, then action. People started talking. Social media networks were lit up by the sharing of information. And virtually overnight, the national conversation shifted considerably. Little over a month after the first rallies and flash mob round dances took place across Canada, Idle No More has become an international movement. At the heart of Idle No More is a desire to foster dialogue. People are talking, and about many things - not only Bill C 45, but also the relationship between Canada and its First Peoples, protection of the environment, the economy, and the Third World conditions of some of our communities. People are also talking about how they can contribute. It was in this spirit of pitching in that musicians Holly McNarland, Kevin Joseph, Ron Harris (Ostwelve), and Marty Ballentyne came together to work on gathering tracks from artists in support of Idle No More, to be released as a series of free downloadable collections of songs. This is the first. Idle No More: Songs for Life Vol. 1 is the first of an ongoing series of free downloadable compilations of songs by artists who support the vision of Idle No More. Over the past few weeks we’ve been contacting people from across Canada and around the world, and the response has been fantastic. It’s a feast for the ears. A celebration. And we’re only just getting started. If ever we’ve been idle - whether in our thoughts or our actions - we are now Idle No More. Jenn Grant: "Perhaps music can help spread awareness and support our precious earth, and to our leaders who are fighting this cause. Let us grow together and show our cause and concern. Canadians need to shout and sing and sometimes starve - let us be heard. " Holly McNarland: My focus is to speak to music fans and to hopefully sway some of the opinions and myths about First Nations people, and shine some light on how the Harper Government is selling us out via our water, land and resources. Bill C-45 needs to go. Whitehorse: We believe that conditions in many First Nations' communities are deplorable and would not be tolerated in neighbourhoods in Toronto or Calgary (for example) and as such there is a deep double standard at play in Canada. We support Attawapiskat Chief Theresa Spence and urge Prime Minister Stephen Harper to meet with her. Also, the shredding of environmental regulations and the defunding of environmental and science organizations at the very time when there is a push by Harper to build a pipeline through environmentally vulnerable lands and waters is cause for great concern to all Canadians.